Baskin Robbins has released a new coupon good for a Buy One, Get One FREE Cone! Offer is valid for any flavor (excludes waffle cones). Limit one coupon per customer per visit. This coupon expires September 6th. This coupon expires July 6th. This coupon expires March 6th. Baskin Robbins has released a new coupon good for a Buy 1, Get 1 FREE Scoop or Swirl (in a cone or cup!). Offer is valid for any flavor. Limit one coupon per customer per visit. This coupon expires February 28th. This coupon expires February 6th. 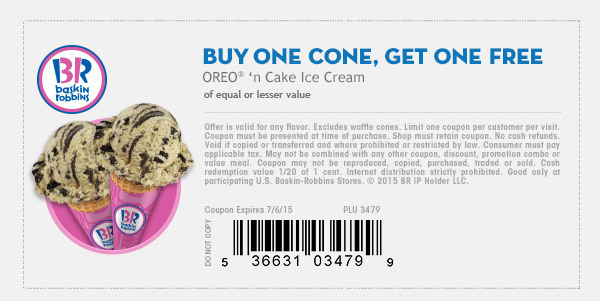 Head over to Baskin Robbins and buy one cone, get one free with this printable coupon! Offer is valid for any flavor. Excludes waffle cones. This coupon expires December 6th.